Today, AMG is the in-house performance arm of Mercedes-Benz. Cars with AMG badges on them generally come with more performance-oriented bits, extra power and a higher price tag. And all of that can be traced back to cars like this 1979 Mercedes-Benz 500 TE AMG. AMG started out as an independent engineering company that built race engines in the late ’60s. In the ’70s, it began offering upgrades and accessory packages for certain Mercedes-Benz cars, as well as building conversions. 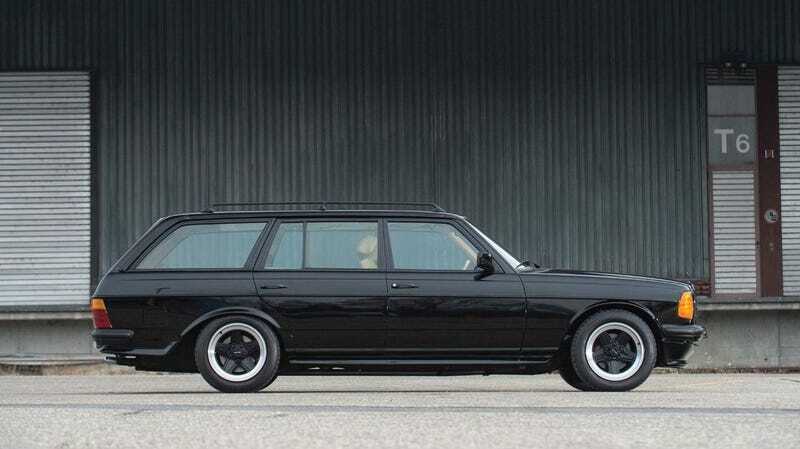 This W123 wagon chassis is apparently one of the earliest ones to receive an AMG conversion treatment, according to its listing on RM Sotheby’s. tubular headers, downpipes, secondary oil cooler and motor mounts custom designed to fit the W123 wagon’s engine bay. The car also retained a full AMG body kit, OE skid plate, cast aluminium rear suspension, date-stamped 1979 Recaro seats with upholstery that matched the door cards, taxi upper console for additional gauges and other hallmarks indicative of an early AMG conversion. All of this seems to suggest that the car was built by the very folks at AMG, or at least by someone who was an expert on Mercedes-Benz and AMG during a time when most people hadn’t even heard of AMG. But, as the listing admits, there’s no proof of any of this. It’s all a hunch, though a pretty fun one at that. I’m not sure I’d care. This thing owns. Anyway, it’s also been featured on an episode of Top Gear America and it looks simply awesome. Clean, black and unmistakably 1970s German. What more could you ask for? The W123 will be part of RM Sotheby’s Essen auction, taking place April. It’s estimated to sell between €60,000 and €70,000 (about $69,000 to $80,000).